Swallow • Forced from the office in December as scandal grew in scope. 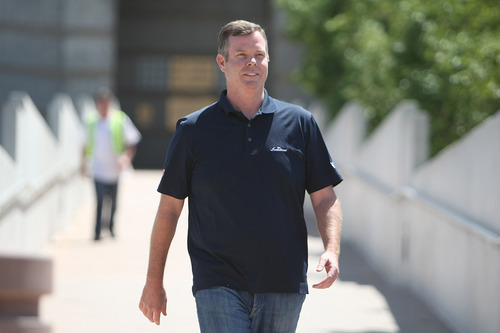 Francisco Kjolseth | The Salt Lake Tribune Former Utah Attorney General John Swallow leaves the Salt Lake County Jail after being arrested earlier in the day on Tuesday, July 15, 2014. 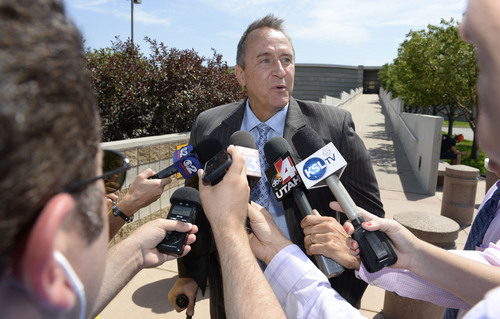 Melissa majchrzak | for The Salt Lake Tribune Former Utah Attorney General Mark Shurtleff talks to reporters as he leaves the Salt Lake County Jail after being arrested earlier in the day on Tuesday, July 15, 2014. Chris Detrick | The Salt Lake Tribune Former Attorney General John Swallow walks from the Salt Lake County Jail Tuesday July 15, 2014. Swallow, who was driven from office in December less than a year into his first term, was charged with 11 felonies and two misdemeanors, including multiple counts of receiving or soliciting bribes, accepting gifts, tampering with evidence, obstructing justice and participating in a pattern of unlawful conduct. 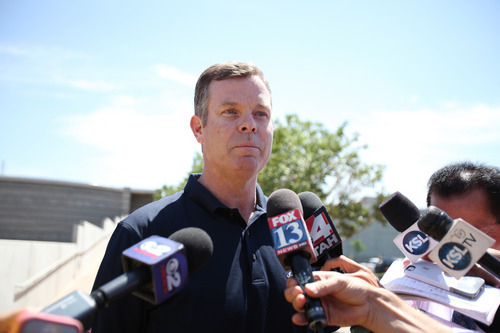 Melissa Majchrzak | For The Salt Lake Tribune Former Utah Attorney General John Swallow talks to reporters after leaving the Salt Lake County Jail after being arrested earlier in the day on Tuesday, July 15, 2014. Trent Nelson | The Salt Lake Tribune Former Utah Attorney General Mark Shurtleff addresses his arrest during a press conference in Salt Lake City, Tuesday July 15, 2014. 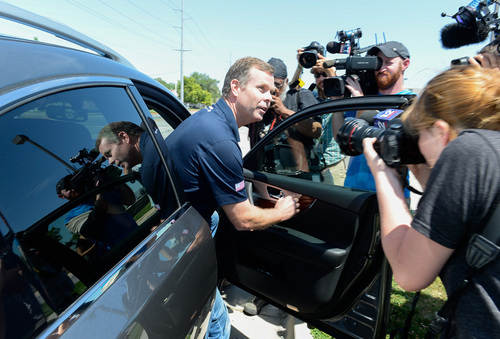 Melissa Majchrzak | For The Salt Lake Tribune Former Utah Attorney General John Swallow leaves the Salt Lake County Jail after being arrested earlier in the day on Tuesday, July 15, 2014. 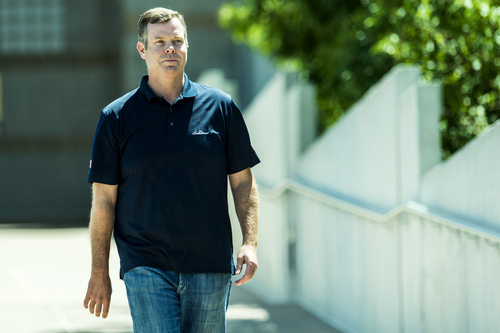 Chris Detrick | The Salt Lake Tribune Former Attorney General John Swallow walks from the Salt Lake County Jail Tuesday July 15, 2014. Swallow, who was driven from office in December less than a year into his first term, was charged with 11 felonies and two misdemeanors, including multiple counts of receiving or soliciting bribes, accepting gifts, tampering with evidence, obstructing justice and participating in a pattern of unlawful conduct. 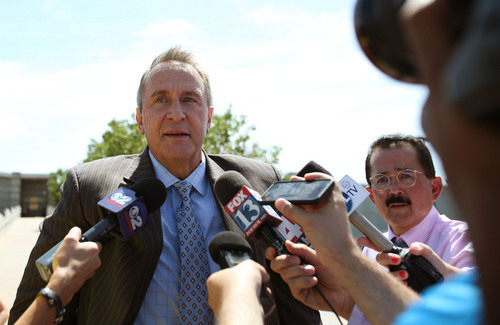 Francisco Kjolseth | The Salt Lake Tribune Former Utah Attorney General Mark Shurtleff talks to reporters as he leaves the Salt Lake County Jail after being arrested earlier in the day on Tuesday, July 15, 2014. 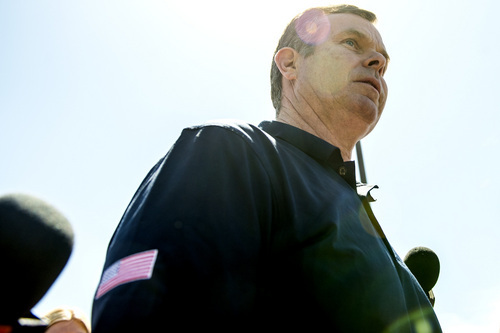 Francisco Kjolseth | The Salt Lake Tribune Former Utah Attorney General John Swallow leaves the Salt Lake County Jail after being arrested earlier in the day on Tuesday, July 15, 2014. Francisco Kjolseth | The Salt Lake Tribune Former Utah Attorney General John Swallow leaves the Salt Lake County Jail after being arrested earlier in the day on Tuesday, July 15, 2014. Trent Nelson | The Salt Lake Tribune Public Safety Commissioner Keith Squires, Davis County Attorney Troy Rawlings, Salt Lake County District Attorney Sim Gill, and Mary Rook, special agent in charge of the FBI office in Salt Lake City prepare to announce the arrest of former Utah Attorneys General Mark Shurtleff and John Swallow at a press conference at FBI headquarters in Salt Lake City, Tuesday July 15, 2014. Former Utah Attorney General John Swallow is seen in his booking mug from the Salt Lake County Jail. He was arrested on July 15, 2014. Melissa majchrzak | for The Salt Lake Tribune Former Utah Attorney General Mark Shurtleff gets a hug from his daughter Annie as he leaves the Salt Lake County Jail after being arrested earlier in the day on Tuesday, July 15, 2014. (Courtesy KUTV) Former Attorney General Mark Shurtleff leaving his home on the morning of July 15, 2014, to be arrested and booked in the Salt Lake County Jail. Chris Detrick | The Salt Lake Tribune Former Attorney General John Swallow walks from the Salt Lake County Jail Tuesday July 15, 2014. 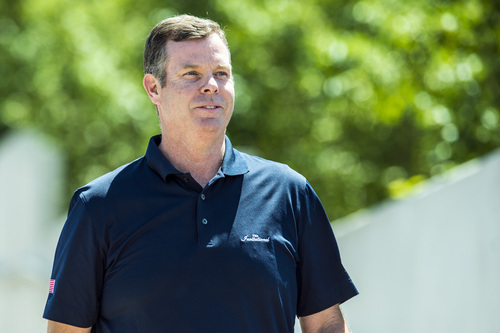 Swallow, who was driven from office in December less than a year into his first term, was charged with 11 felonies and two misdemeanors, including multiple counts of receiving or soliciting bribes, accepting gifts, tampering with evidence, obstructing justice and participating in a pattern of unlawful conduct. In the culmination of the most sweeping political scandal in Utah history, former Attorneys General John Swallow and Mark Shurtleff were arrested Tuesday and charged with a combined 23 counts that could land each in prison for 30 years. The two men were taken into custody at their homes without incident Tuesday morning and booked into the Salt Lake County Jail. Bail was set at $250,000 each. Shurtleff was released about 11:45 a.m. Swallow was let out about 12:15 p.m. Swallow, who was forced from office in December less than a year into his first term, was charged in 3rd District Court with 11 felonies and two misdemeanors, including multiple counts of receiving or soliciting bribes, accepting gifts, tampering with evidence, obstructing justice and participating in a pattern of unlawful conduct. Shurtleff, who served 12 years as attorney general before making Swallow his handpicked Republican successor, was charged with 10 felonies, including receiving or soliciting bribes, accepting gifts, tampering with witnesses and evidence, and participating in a pattern of unlawful conduct. The charges come after two years of investigative work by state and federal authorities, as well as the Utah Legislature and the lieutenant governor&apos;s office. Mary Rook, special agent in charge of the FBI&apos;s Salt Lake City office, said investigators will continue to pursue information uncovered during the probe. "This has been a complex, nuanced, multiple investigation. ... Multiple leads continue to be investigated [and] the investigation remains active," said Salt Lake County District Attorney Sim Gill. "We have filed what we think are appropriate and minimal charges. We could have filed more, but we chose at this time to just file what we did." Gill, a Democrat, denied any political motivation in the probe, noting he worked alongside Davis County Attorney Troy Rawlings, a Republican, investigators from the state Department of Public Safety and the FBI. He also cited independent inquiries by a bipartisan Utah House committee and the Republican-led lieutenant governor&apos;s office. "We are all public servants," Gill said. "We took an oath to uphold the law and do our jobs professionally and competently. … There is absolutely no political motivation." In an afternoon news conference after his release, Shurtleff, who has repeatedly proclaimed his innocence, lambasted Gill, accusing the Democratic D.A. of playing politics with the probe and bringing charges "he knows he cannot possibly prove beyond a reasonable doubt" simply to enhance his re-election prospects this fall. Shurtleff said he is "not perfect. I never professed to be." "I, as all of us, made mistakes in my time as attorney general, probably, clearly errors in judgment, but I have never intentionally committed any violation of the ethics, codes of ethics," he said. "I have never misused or abused the public trust and I have certainly not violated any of the criminal laws of the state." 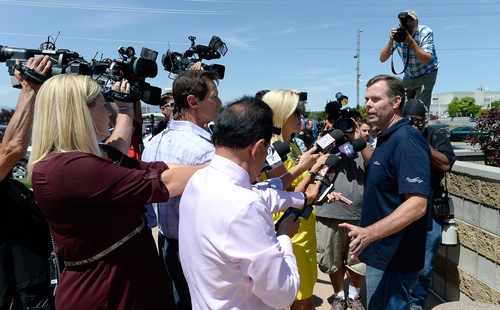 As Swallow walked out of the jail, wearing a dark blue polo shirt and jeans, he headed straight for a crowd of news crews, photographers and reporters. "This finally gives us the opportunity to start to respond back. With multiple investigations, we were hesitant to say anything. Now, we have our constitutional right to make our case in court, " said Swallow, who has maintained his innocence throughout the mushrooming scandal. "I look forward to that." The allegations detailed in the charging documents span several years and involve intricate schemes with numerous characters. 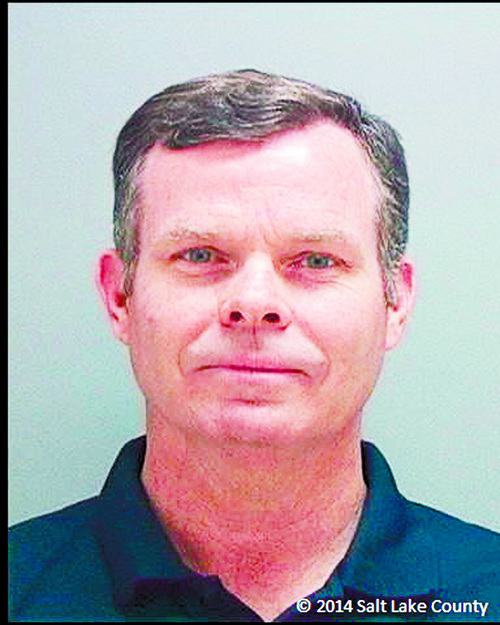 • Swallow is accused of accepting $17,000 in gold coins from Richard Rawle, the now-deceased owner of the Provo-based Check City payday-loan chain. 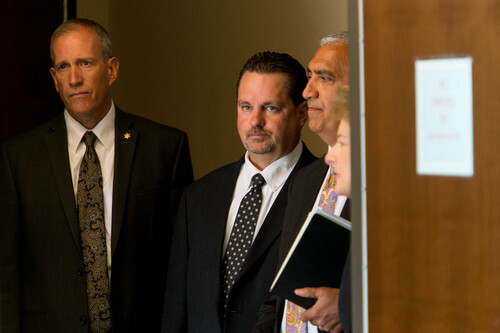 • Shurtleff and Swallow are accused of taking illegal gifts from the now-indicted Jeremy Johnson at a time when Johnson was seeking a legal opinion that would enable the southern Utah businessman to process online-poker transactions. Both men rode on Johnson&apos;s private jet and stayed in his St. George homes. Swallow also twice used Johnson&apos;s luxury Lake Powell houseboat. • After an April 2012 meeting with Johnson at an Orem Krispy Kreme doughnut shop  an encounter Johnson secretly recorded  Swallow allegedly began destroying and falsifying evidence to cover up a deal he made in which Johnson paid $250,000 to Rawle to enlist Senate Majority Leader Harry Reid&apos;s help to stave off a federal investigation of Johnson&apos;s I Works business. • Swallow is accused of asking Johnson&apos;s former attorney for $120,000, which Swallow allegedly said could help Johnson&apos;s legal woes. Johnson now faces 86 federal criminal charges in connection to I Works. His current lawyer, Ron Yengich, declined to comment on Tuesday&apos;s events, citing a gag order issued in Johnson&apos;s criminal case. 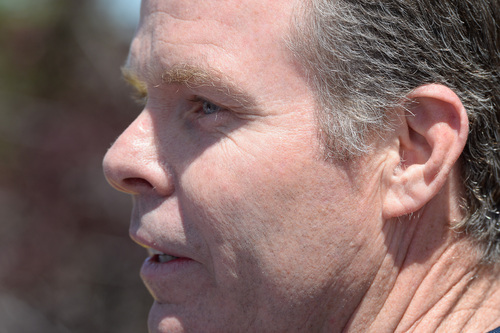 The St. George businessman&apos;s allegations, which made headlines just days after Swallow took office as attorney general in January 2013, prompted the scandal. • Shurtleff and Swallow are accused of staying in the lavish Newport Beach villa of now-jailed businessman Marc Sessions Jenson, while Jenson was free on a plea deal to securities charges that Shurtleff was directly involved in negotiating and while Jenson was still under the supervision of the attorney general&apos;s office. The gifts exceeded limits for public officials, although the trips occurred before Swallow joined the office. • Shurtleff allegedly dismissed a massive mortgage-fraud lawsuit against Bank of America against the wishes of his own staff prosecutors at a time he was negotiating a job with a law firm that represented the bank. READ MORE: Gov. Gary Herbert called the arrests a "sad day for Utah"
Swallow and Shurtleff remained at the Salt Lake County Jail for about three hours Tuesday as they were photographed, fingerprinted and searched, as is customary in the booking process. Although bail was set at $250,000 for each, both were released through Pretrial Services, meaning they entered into a supervised release arrangement and did not have to post a bond to get out. This was part of an offer made by Gill&apos;s office as a show of good faith to the former attorneys general. "They are first-time offenders," Gill said in an interview. "But they&apos;re first-time offenders unlike any in the history of the state." Shurtleff, who made his way out of the jail on crutches as a result of a recent surgery, was met by his daughter, whom he embraced as journalists looked on. 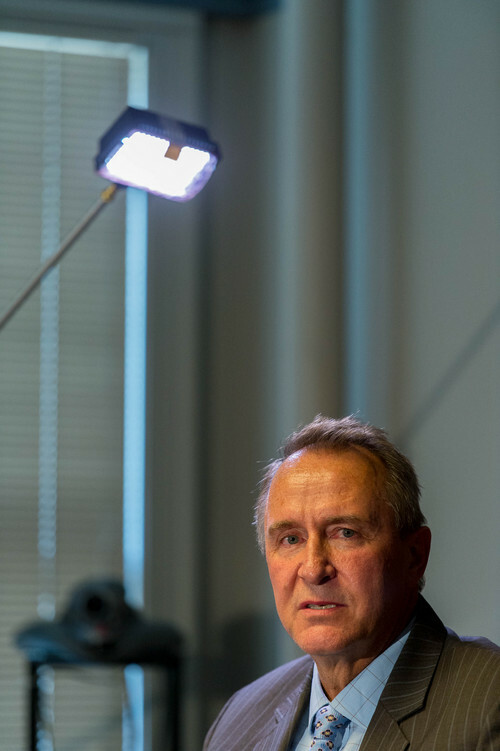 Squinting into the midday sun and making his way to an SUV waiting in the jail parking lot, Shurtleff acknowledged he had "an idea" that he would be arrested Tuesday, but he did not elaborate. Swallow, who exited the jail about a half hour later, said his arrest came as a total surprise. "I absolutely maintain my innocence. This is just a process," Swallow said. "I look forward to my day in court to confront my accusers and to share my side of the story for, really, the first time." Both men commended the treatment they received inside the jail. Swallow said he was held separately from Shurtleff, and the two did not have a chance to communicate, "nor did we attempt to do so."